Jessica and Brian met at college in 2010. At that moment, they had no idea that seven years later they would walk down the aisle and enter together into the sacrament of matrimony. 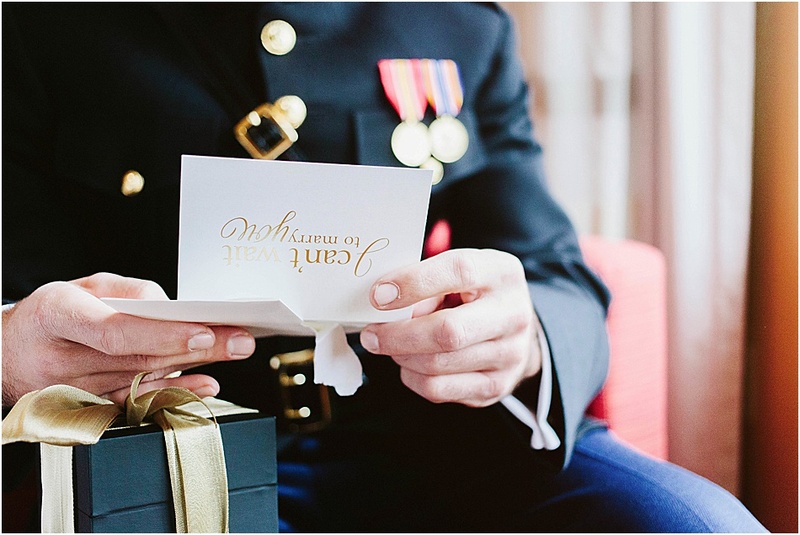 It only took a couple months of dating to realize their mutual desire for marriage, but different career paths and an uncertain military schedule kept Jessica and Brian apart. 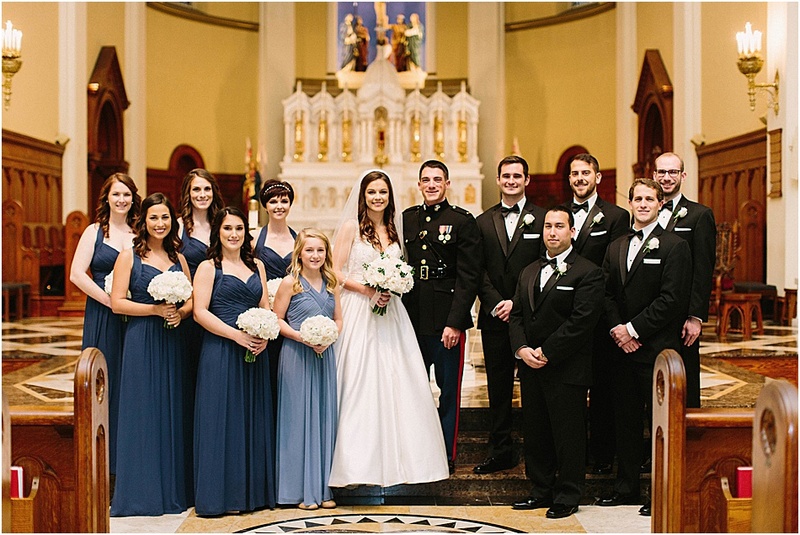 This only grew their desire to be united in marriage, and Brian finally proposed to Jessica in March 2017. 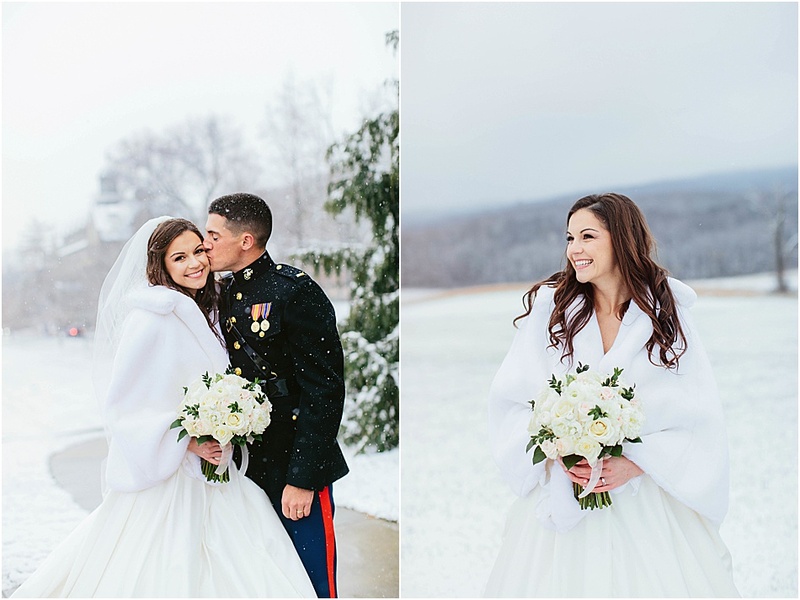 On a magical, snowy day in a beautiful chapel, the happy couple celebrated a winter wedding. 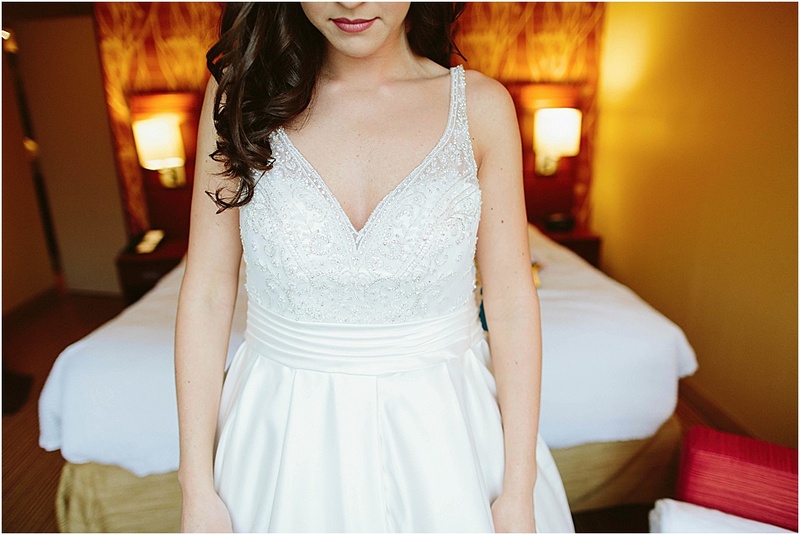 From the Bride: Brian and I both attended Mount Saint Mary’s University and were both business majors. We were in some of the same classes during our freshman year, but we didn’t meet until sophomore year in September 2010. Brian introduced himself after my presentation during one of our business classes, and we spent some time together that weekend. We became quick friends, but he wasn’t looking for anything more than friendship at that time. As for me, I was open to the possibility of a relationship! So we continued to spend time together as Brian prayed and reflected about our future. Three months after we met, he gave me a letter conveying all he had reflected on and asked me to be in a relationship with him. After only two months of dating, we knew one day we’d be husband and wife. Over the next six and a half years, our love steadily grew through attending weekly Mass, praying together, and sharing countless memories. We also identified our lay vocations and began our careers. 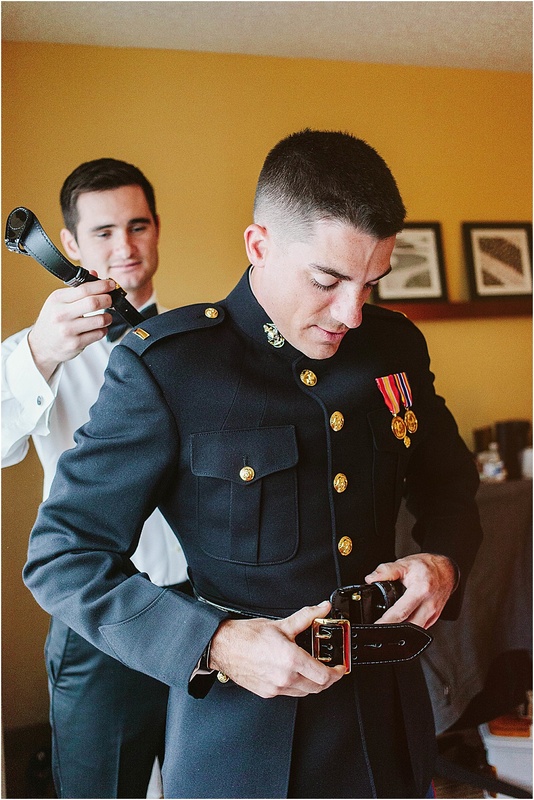 As Brian started his time in the Marine Corps and I pursued a career in finance, we were separated for months at a time. This transition was extremely challenging, and I leaned heavily on prayer as I learned to trust in God’s plan. Being separated by geography and Brian’s irregular schedule taught us not to take our relationship for granted. In March 2017, he proposed to me on the front steps of Mount de Sales Academy, my alma mater. As we began planning, Brian and I wanted our wedding day to be centered on our love for God and each other. 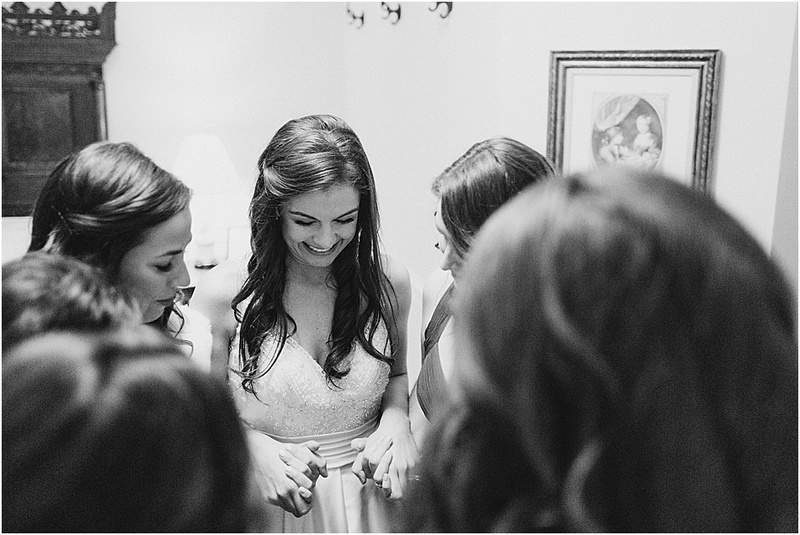 And we wanted each of our guests to feel this love coming through every detail. Our celebrant, Father Thomas Haan, had been Brian’s college lacrosse team chaplain, a close friend and spiritual guide throughout our relationship. 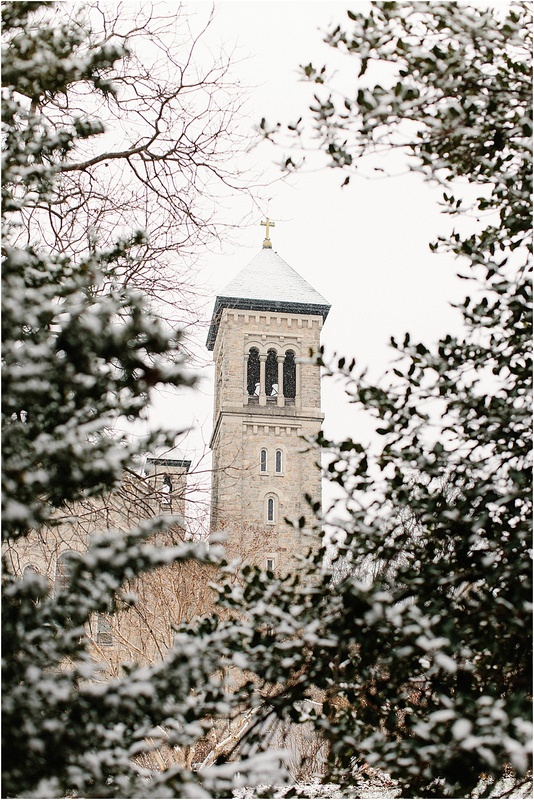 He celebrated our nuptial Mass on a beautiful, snowy December day at Mount St. Mary’s in the Chapel of the Immaculate Conception. This was our favorite part of the day: the nuptial Mass and exchange of vows. As Catholics, making a commitment to God and each other in front of our families and friends was very important to us. We also felt blessed to have our families involved in our wedding day in big ways. Brian’s aunt made the invitations, and my loving godparents provided my entire wedding ensemble. My godfather bought my veil, headband, and dress, and my godmother made my faux fur shawl. 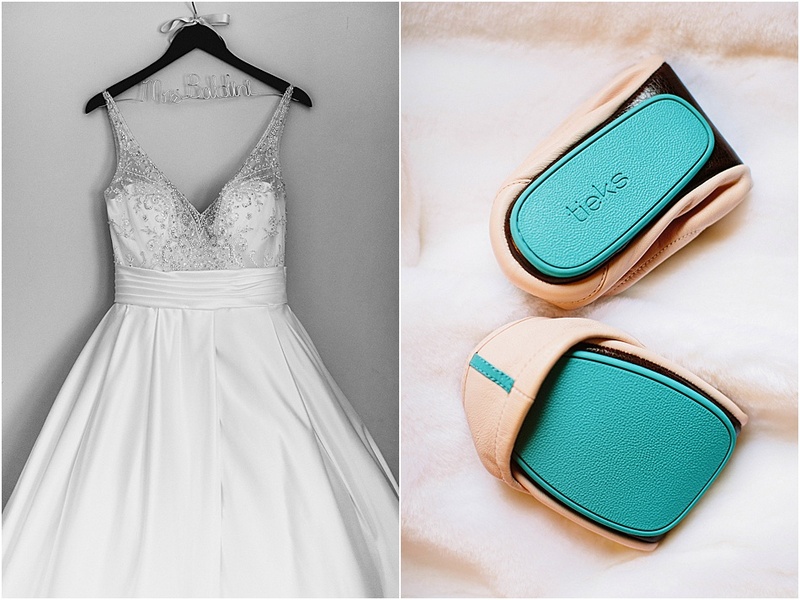 Everything put together made me feel truly beautiful as I married Brian. 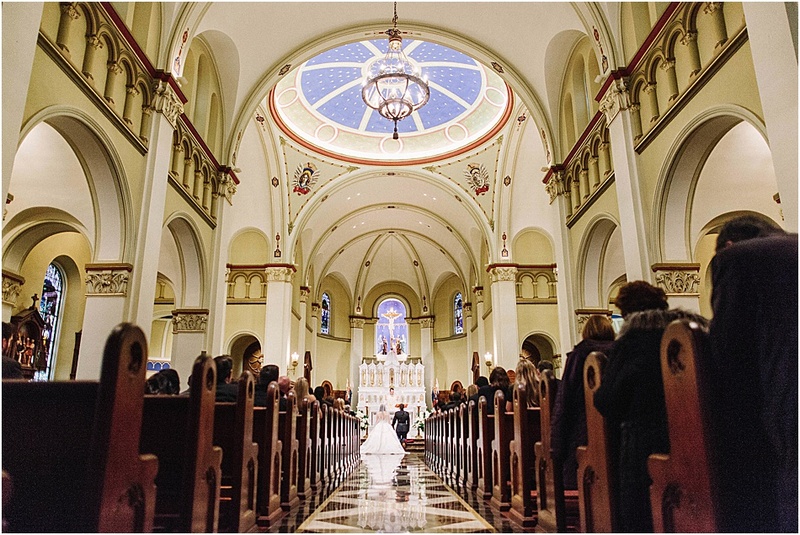 From Elizabeth, the Photographer: Shooting a lot of Catholic weddings, I hear a lot of homilies. But every now and then one of them forces me to stop and listen instead of moving around the church wondering what shot I should capture next. Father Haan nailed it for Brian and Jessica! There was something so personal about his sermon. It was evident that he knew the couple well, and that he and Brian had a great relationship. He highlighted how the Lord favors their union, specifically through the Blessed Mother's constant intercession for them. 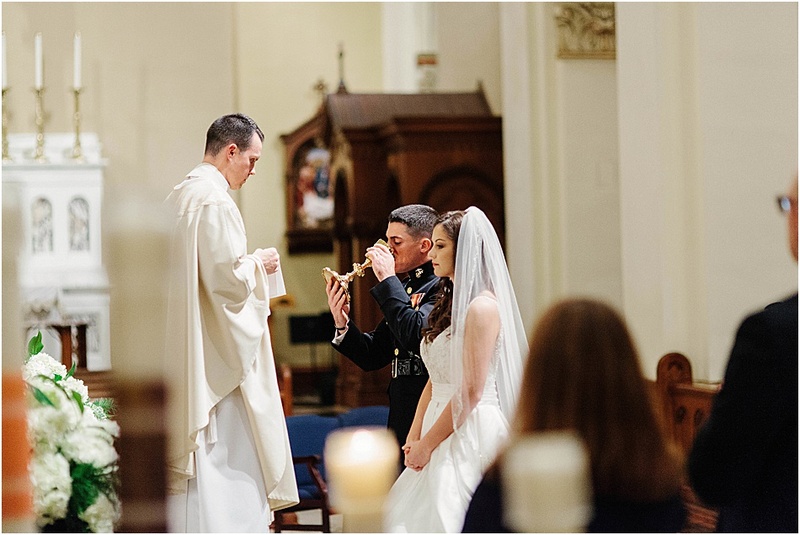 Brian was born in Our Lady of Lourdes Hospital, and Jessica developed a strong devotion to Our Lady in high school at Mount de Sales Academy. Both Jessica and Brian chose to attend Mount Saint Mary's University. 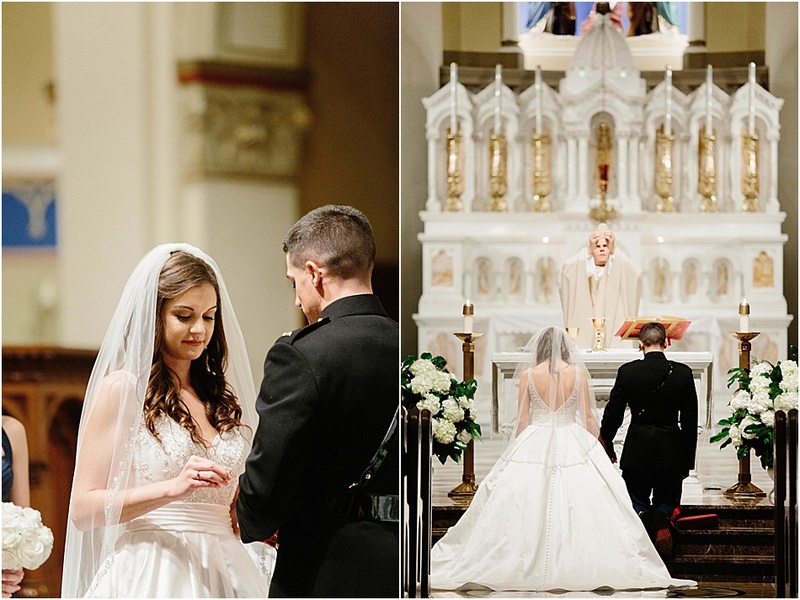 Then on December 9, one day after the feast of the Immaculate Conception, they were married in the Chapel of the Immaculate Conception at Mount Saint Mary's. 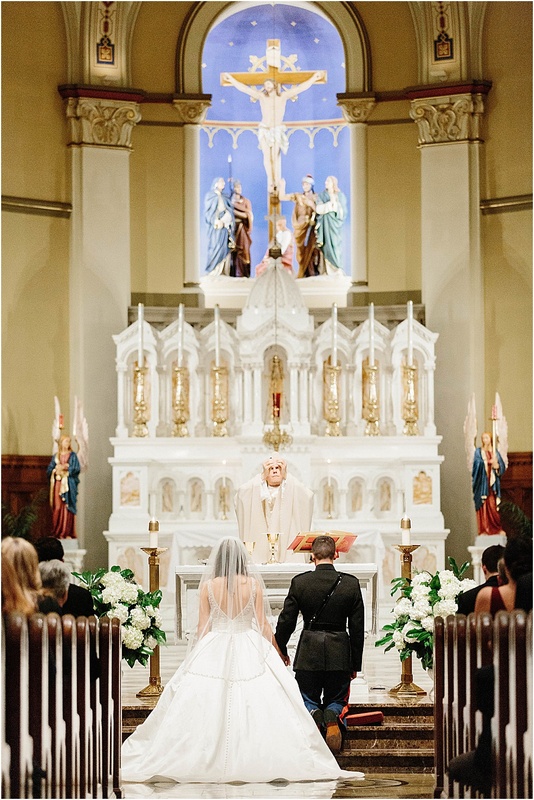 Father explained that it wasn't a coincidence their faithfulness to the Lord and his Blessed Mother was made visible in their union as husband and wife.